Manchester City moved back to the top of the Premier League on Saturday afternoon with a 3-1 win over Everton at the Etihad Stadium. 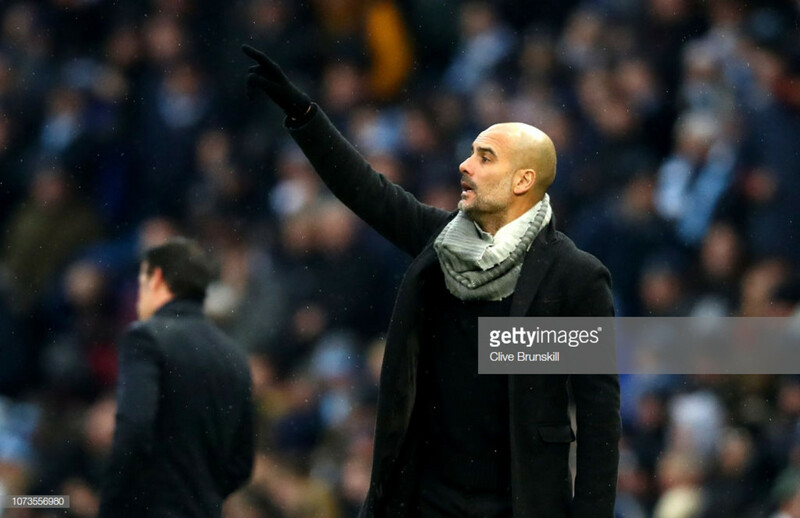 Manchester City manager Pep Guardiola was left delighted with his side’s performance as they beat a wasteful Everton 3-1 at the Etihad Stadium on Saturday afternoon to move back to the top of the Premier League. After an unusual sloppy start, City took the lead around 22 minutes into the game as Gabriel Jesus slotted home following a sublime through ball from Leroy Sané. The same combination came back to haunt the Toffees again at the start of the second-half as Jesus headed home to put the hosts in cruise control. Everton did get themselves back into the game with around 25 minutes left to play as Dominic Calvert-Lewin diverted Lucas Digne’s cross into the bottom corner. But it wasn’t meant to be as City restored their two-goal advantage just minutes later through substitute Raheem Sterling. It has been a tough run of fixtures for Guardiola’s side having played Chelsea last weekend and Hoffenheim in midweek, and he had feared the worst coming into this match. “It was a tricky game. We only had a few days to recover after the Champions League. I had a feeling my players were going to suffer. It was not finished until the final whistle. The players again made an incredible effort to win the game and get the three points. Guardiola described it as a “complicated” game with the likes of Richarlison and Bernard causing his side problems on numerous occasions throughout the game, especially towards the end of the second-half. However, he was delighted with his side’s application and ability to get the result, even if it wasn’t the perfect performance. Sterling has found himself in the media spotlight again this week following his allegations of racial abuse in last weekend’s 2-0 defeat to Chelsea. It came as a surprise to many that he was left out of the starting line-up for this game after his performance against Hoffenheim in midweek, but he still managed to have an impact on today’s game as he scored his ninth goal of the season shortly after coming off the bench. Guardiola was pleased with the impact he made: “When Raheem has no time to think it’s always a goal. It is when he has time to think that it causes a problem. He has been so calm this week. He has handled a lot of rumours over the last few years. Another positive for City was the performance of Gabriel Jesus. The Brazilian striker had come under scrutiny in recent weeks having gone a significant amount of time without scoring at the Etihad Stadium. However, he answered his critics in style with two classy finishes in today’s match. Guardiola was pleased with his overall performance and feels that his family moving over to Manchester recently may have helped improve his performance. He said: “It is important for him to score goals. He has produced the same performance in previous games but today he has scored the goals to go with that. It will be so good for him and the team. City will remain top of the Premier League for the next few hours at least, with Liverpool taking on Manchester United on Sunday afternoon in the weekend's biggest game.